It’s one thing to have the “latest and greatest” equipment, but, without a knowledgeable, well-trained paving crew, what benefit do you reap. A paving crew with the proper training impacts your productivity and profitability and allows you to meet or exceed the most demanding job specs. Investing in these crew members starts from the ground up with a professional, experienced trainer. Carolina Construction School is here to make sure you and your team have the skills to get the most out of your paving equipment. Our small classes offer hands-on opportunities and our instructors bring years of experience to the classroom. 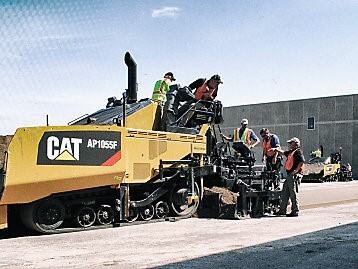 This structured four-and-a-half day course emphasizes the fundamentals of asphalt paving, then moves into more advanced paving techniques. Attendees spend a half-day each day in the classroom, then get a half-day of hands-on training at our paving demo site. Working in teams, they practice with a current Cat paver and screed. Maximum class size is eight students. Tuition: $3,100.00/student. For a class schedule, please visit our Calendar page to see the next available class date. LCI-Lineberger Construction, Inc is the NCCER Accredited Training Sponsor of Carolina Construction School, LLC. Carolina Construction School is a proud member of the National Safety Council. Copyright 2019 © LCI Construction, Inc.